There was a time, not so long ago, when it was Carson Wentz chasing Dak Prescott, and not the other way around. Carson Wentz and Dak Prescott have taken turns enjoying big seasons. They first met as rookies in late October 2016 at AT&T Stadium. Prescott tied it up late in regulation with a dart to Dez Bryant in the end zone and followed that up with an overtime TD to Jason Witten to complete the double-digit comeback. Prescott went on to win NFL Offensive Rookie of the Year honors, and the Cowboys cruised to a division crown with a 13-3 record. By the time these two teams met in the '16 finale, Dallas was prepping for the postseason and many of the starters, including Prescott, made only cameos in the game. It's striking how much has changed over the past year-plus. Wentz developed into an MVP candidate in his sophomore season, helping the Eagles improve from 7-9 to 13-3 en route to their first Super Bowl title. Prescott, meanwhile, has experienced a statistical tumble almost across the board, with the Cowboys' record sinking right with it. Turmoil is seeping into Big D. Legendary QB Troy Aikman is calling for a "complete overhaul of the entire organization," and with Prescott soon to be eligible for a contract extension, the debate has started in earnest whether the Cowboys should tie themselves to him long term. 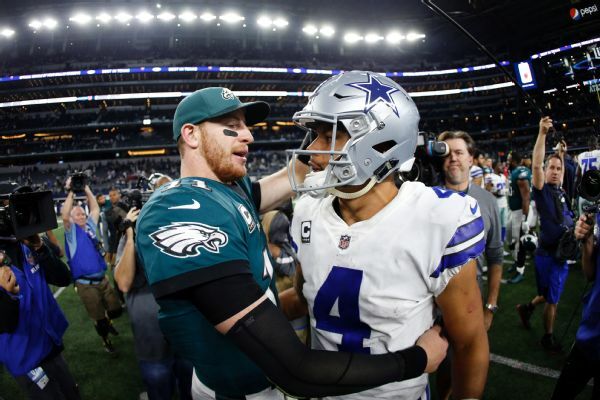 So, yeah, the fourth official meeting between Wentz and Prescott is shaping up to be a significant one, not just for the direction of the 2018 season for the Eagles (4-4) and Cowboys (3-5), but in Dallas' case, it can also be looked at as another piece of evidence submitted as they weigh the direction of the franchise. In their words: What do you admire about the other guy? Wentz: "Coming into the league at the same time as Dak and knowing him as a person and as a competitor, I just love his competitiveness. We're both kind of wired the same way in that area. He's always going to compete and fight to the end, and I'm kind of wired the same way, so I definitely admire that about him." Prescott: "He’s a great player. I love watching him play, watching him on film or when I’m breaking down another defense and they’re playing the Eagles, he’s one of the first guys that I’m watching. He takes what they give him. He’s very aggressive. Just a really good player. Just coming in [together], hopeful that this is a rivalry that can come for a long time with us." What’s the biggest question mark remaining on these two? ESPN Eagles reporter Tim McManus: For Wentz, it's whether he can stay healthy and do what it takes to limit unnecessary punishment. He has shown pretty good discipline in this respect since returning Week 3 from ACL/LCL surgery. The attack mentality remains, but for the most part Wentz has been smart about not throwing his body into oncoming traffic, as he did at times over his first two seasons. He not only has a serious multi-ligament knee injury on his medical chart, but also broken ribs that cost him preseason games his rookie year and a broken wrist that sidelined him for much of his senior season at North Dakota State. Wentz is never going to change his stripes when it comes to being aggressive, but it's critical, both for his health and the health of the franchise, that he doesn't cross the line into recklessness. The other area for potential improvement is striking more of a balance between playing "on time" and improvisation. Wentz is often at his best when he is extending plays with his feet and creating opportunities downfield. That style can also lead to negative plays and a lack of offensive rhythm. If he can operate within the system a touch more while maintaining the big-play mentality, defenses will be helpless. ESPN Cowboys reporter Todd Archer: Since his rookie year, Prescott has been a .500 quarterback. Was 2016 the aberration? In his past 16 games, he has 16 touchdown passes, 14 interceptions and lost seven fumbles. This was a big season for Prescott because if he played well, the Cowboys would undoubtedly want to lock him up to a long-term deal in the offseason, but so far his play has not warranted a big-time contract. Owner Jerry Jones is on record that the Cowboys will extend Prescott. That is more a case of backing his quarterback at a time in which he needs backing more than an actual guarantee. The organization did him no favors at the start of the year by going with a wide receiver by committee to replace Dez Bryant’s production and not finding pieces at tight end to replace Jason Witten. The trade for Amari Cooper will help Prescott and also help the organization evaluate what Prescott can be when given a viable No. 1 option on the outside. What’s the best trait of each quarterback? McManus: There are plenty to choose from. Wentz has ideal size at 6-foot-5, 237 pounds and athleticism, and he is blessed with a rocket arm and a natural ability to lead. His determination, though, fueled by an unrelenting, steel-trap mind, is what makes him exceptional. It was on display during his pinpoint rehab process this offseason, which had him ahead of schedule the whole way. His painstaking attention to detail ensures every box is checked, whether it's in the recovery room or during his game preparation. No time is wasted, every action is purposeful and the goal never falls out of sight. Archer: Prescott has all of the intangibles a team wants in a quarterback. He is a strong leader, unafraid to say what needs to be said when it needs to be said. He is accountable. He makes sure everybody knows he needs to play better when things go poorly. He deflects praise. He is quick to point out the success of others before patting himself on the back. He is tough. He will take some hits, and he will do what he can to gain extra yards in tough situations, even if it will put him at risk of injury. He is willing to put in the work. Before the offseason program officially began, he was at The Star working out with teammates. When the program officially ended in June, he remained working out with his pass-catchers. He had organized workouts off campus, as well. He has demonstrated all of these traits from the first moment he was asked to take over for an injured Tony Romo in the 2016 preseason. The quarterback of the Cowboys faces a lot of challenges, but Prescott does not shy away from any of them.